Patios can be termed as ‘unique’ as there are no limitations to their design by the requirement of ceilings or walls. There is no requirement of them being shaped like boxes. This is so unlike the rooms in a home. With all the freedom you get, patio designing can be a fun and exciting job. You can opt for a circle, rectangle or even a square is the shape of your patio. You can think of extending the backyard into a spectacular living space. Before opting for a specific design for a patio it is important to consider certain factors. Most families use the patio as weekend’s outings or only for family meals. Count the number of family members to determine the minimum number of people using the patio. Consider the other possibilities with the patio. Having an exact knowledge of how many people you intend entertaining on the patio can give you a fair idea of the size of the patio. The nest step in the patio design is making up your mind whether you intend cooking outdoors. If so, you need additional space for the cooking appliance ad bar be cue or whatever else is required. You can think of including a small fountain which can block the noise pollution from the outside. If you intend using the patio even during hot summers, it is advisable to plan out a covered patio. This can also work as an apt protection against thunder and lightning. The looks of a patio make a total difference to the total looks of a home. You can seek help of professionals for an apt patio design or probably go through the different patio designs available online. 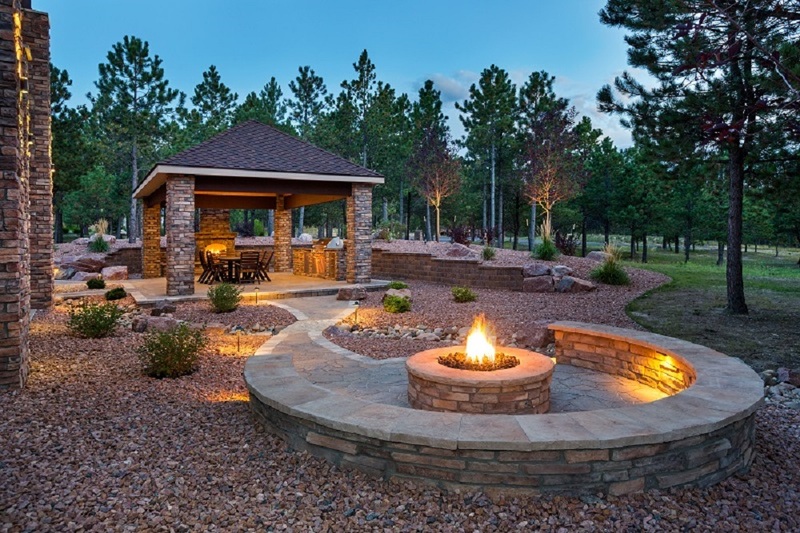 Knowing your budget can determine what features you can include in the patio design. You can choose between the various different materials for making a patio. Listed below are just a few to start you off. Stone: Stone is one option which is durable and natural option. It is advisable to look for a local stone as this tends to be environmental friendly and is also priced reasonably. This tends to blend well with the existing structure and can complement your hoe totally. Stone is hardy and durable and you get the ultimate value for money when you build stone patios. 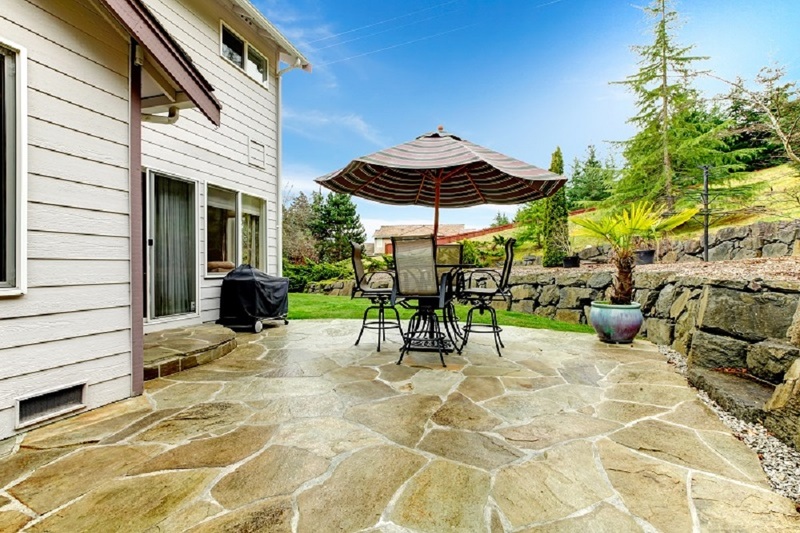 Poured Concrete Patios: As we are aware that concrete is a mixture of sand, cement and gravel. This mixed with water to offer a pouring consistency. This semi liquid mixture offers you the option of getting the patio constructed in any which shape desired. You also have the choice of geometric shapes or the curved types of patios. Porcelain Patios: Porcelain tiles or ceramic tend to offer a unique look to patios. As tiles are available in different sizes and styles they tend to offer a seamless transition from the indoors to the outdoors. You need to ensure that the tiles used for patios are not the porous type and that they do not absorb much of water. This keeps them protected from the changes in weather and temperatures. Go all the way and design the outdoor space with an apt patio design. Before choosing a specific company for this patio design ensure the reputation and experience so that there are no uncalled-for problems. Comparing the services of two or more companies can help you choose better where the qualities of services are concerned.